world read about a war that threatened to attain nuclear flashpoint. side of the story has been told, the Indian story has not. an indigenous aviation and space program. Forces and an epilogue on the men who fought the war. Indian Air Force itself has not made public its records of the war. serving IAF officers in an unofficial capacity. Pakistan - prior to the outbreak of hostilities. 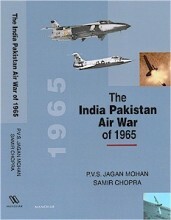 Click the button below to add the The India Pakistan Air War of 1965 to your wish list.